Hopkins Theatre-in-English Workshop: Edward R. Fernandez on theater: "Our mission is to teach and learn as well as to produce." Edward R. Fernandez on theater: "Our mission is to teach and learn as well as to produce." It’s May 2nd, a playful sun plays with a drowsy rain outside the Ephrata Performing Arts Center near Lancaster, Pennsylvania, and Edward Fernandez is in his office talking enthusiastically with this journalist about his artistic career and the debut of “Sunday in the Park with George,” a wonderful show rich in imagination which quite clearly bears the distinctive mark of a dedicated and passionate director. You are now in your 17th year as artistic director at EPAC. How in the world did you get into the fascinating world of theater? Well, actually it goes back to when I was six years old. My mother loved musicals and she would play albums of musicals such as “Carousel” or “My Fair Lady” and she would tell me the stories. She would also take me to movies. One of my most vivid childhood memories is going to movies with my mother. And she put me on stage for the first time! I don’t know how old I was but the first time I stepped on a stage was at the local junior high school in Queens, although I wasn’t even in school yet. I think they were doing a production of “South Pacific.” They put me in shorts and a cap and set me on stage. This guy came out with coconuts and I was terrified because I didn’t know what was going on. My mother loved theater and she instilled that in me. And my father too, he loved the arts. Then you went on to study theater? Was it a community theater? 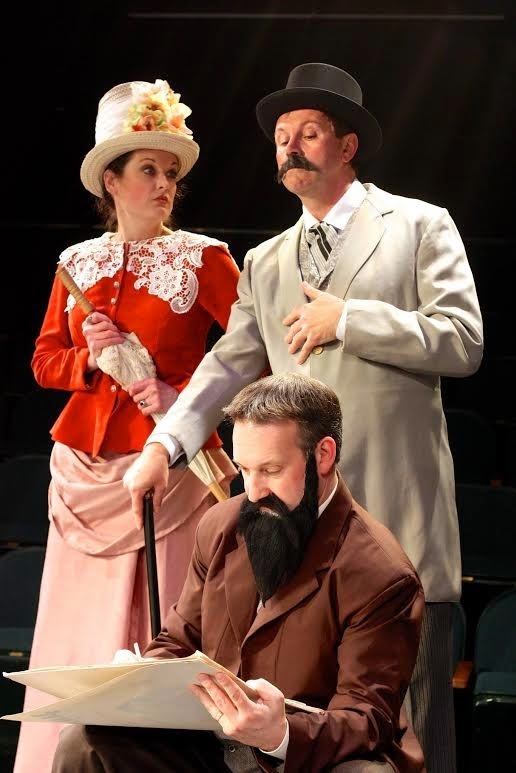 Can we talk a little bit about the concept of Community Theater? It has been maligned but we actually are a sort of semi pro theater. I am paid and we pay people to run the organization. In a real community theater nobody is paid. The actors here are volunteers and also community members but set designers get paid, we have office staff. It operates on a non-profit basis and there is a volunteer board of directors. We are ever expanding, so I don’t know where we are going to go in the future. Is it the only Community Theater in this area? No, there used to be another one, the Fulton Theater in Lancaster but now it is not a Community Theater; of coarse there are other Community Theaters in the area, there is the Lebanon Community Theater, in Harrisburg also. Is there significant interest in theater in this area? Well, there’s not a lot but there is a big enough audience. 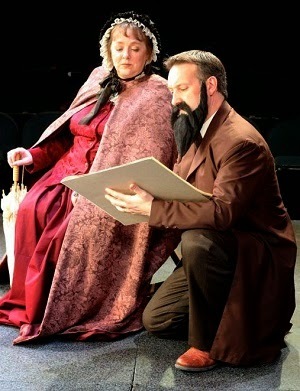 The actors at EPAC are volunteers but nevertheless they have a great level of professionalism. In that sense I am very blessed because we are very demanding in the work we do, whereas some Community Theaters have another philosophy, that it should be fun, almost a social club. We have never been like that. We work very hard. You work with a professional attitude. Yea. We treat our actors as if they were professionals, so the actors who come here tend to be that kind of people: they take their art very seriously. Do they receive training outside EPAC? They tend to be persons who have studied here or elsewhere but life has not allowed them to pursue a professional career. 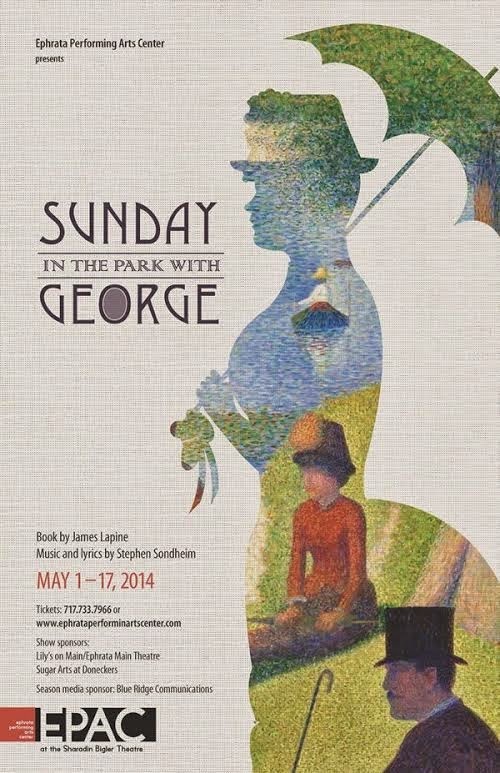 One thing that was clear in “Sunday in the Park with George” was a very good level of diction. Yes, we work on that because we are judged at the same level as professional theaters. The press deals with us the same way as they do professional productions. Even though this is a Community Theater, my products have to be on the same level as those at professional theaters. What are your ideas concerning the training of actors? I direct and teach acting at the same time. So it isn’t just do this or do that. It is what is your objective, what do you want from the scene. It is educational. If you work here as an actor you are going to learn a technique. Our mission is to teach and learn as well as to produce. And the result is that over some 20 years we have built up a beautiful ensemble and in that sense I feel blessed. You will see the same people doing big roles or minor roles. How many actors do you have to call on? That varies greatly but I usually have in my files over 100 people. I do a big audition in January for the whole season, although sometimes we need additional auditions to fill some roles. Are you the only director at EPAC? Oh no. I hire other directors but as artistic director I do about three shows a year. This year I am just doing two, “George” and “Cabaret.” I also train directors. It’s my favorite show. I did it previously here, in 1999, with the same George. I saw the show on Broadway in 1984 and loved it immediately. What called your attention about George? A lot. It is one of those shows where the themes reverberate with me at every level, about why I do what I do, about the choices in my life. Perhaps a lot has to do with my relationship with my mother when I was six years old. In "George" the grandmother Marie represents the feminine influence. Was there a point in the staging of the show where a stalemate appeared? No, not at all. It all went very smoothly. I felt the show with my soul; I knew what I wanted: I knew the moments I wanted, what I wanted to explore and I took it day by day. Whatever the actors gave me I would say OK let’s go further. I like to see what actors bring into a show. Yea, like the freeze, the slides, the paintings, very difficult aspects, some of them we were still working on while the audience was waiting to enter the theater for the debut. Everything had to be very precise. Yea. It doesn’t tell you this is the melody line. Your voice is an instrument carrying the line. But the people I hired for the play knew how to sing. What have the reactions been to the play? We just got a very great review from the Lancaster Intelligencer. Your next projects at the EPAC? “Agnes of God.” A sort of spiritual thriller, mystery. But personally I won't direct anything until “Cabaret, “my other favorite play.